“The impression of an isolated stony world on the edge of a limitless ocean has only accentuated the attraction of the great stone forts and early churches, and much sense and much nonsense has been written about them” John Waddell. 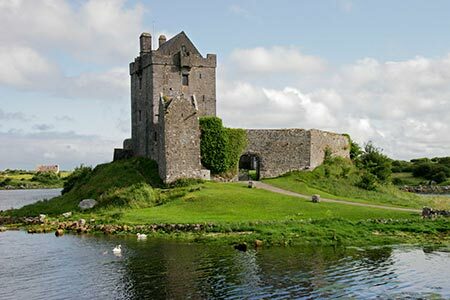 Savor the very best of the west of Ireland in the company of a professional archaeologist and outdoor enthusiast. The abundance of rock in a small area in North Clare gives this region its name-Burren. The landscape, which has been forged by the force of ice and the farming of man, is today a world celebrated karst limestone region famous for its botany, archaeology and geology. Our treks bring you through this landscape in the company of experts- enabling you to sense the significance of this majestic land. 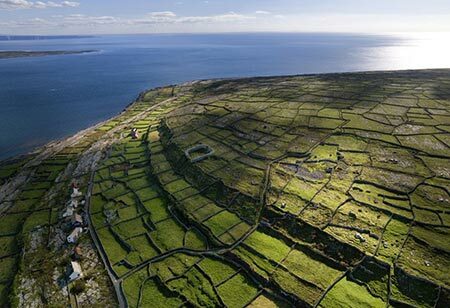 Across the sea to the west of the Burren are the Aran Islands, comprising of three distinct landforms running across the entrance to Galway Bay. Their unique history is captured in the landscape, monuments and people and it is through contact with these elements that our adventure comes to life. Sitting watching the sun go down on Galway Bay or conversing with the locals on such important matters as the weather transports you to a place and a way of life that will stay with you forever. 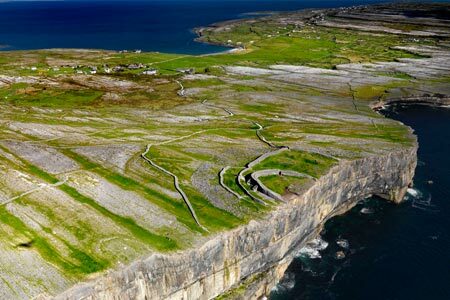 Day 1: Pick-up in Galway City and make our way along the coast to the Burren where we will trek along Black Head affording spectacular views over Galway Bay and the Aran Islands. Along the way we will encounter rare wild flowers and historic settlements that define this area. Our hotel is the ‘Merriman’ in the delightful village of Kinvara on the edge of Galway Bay. 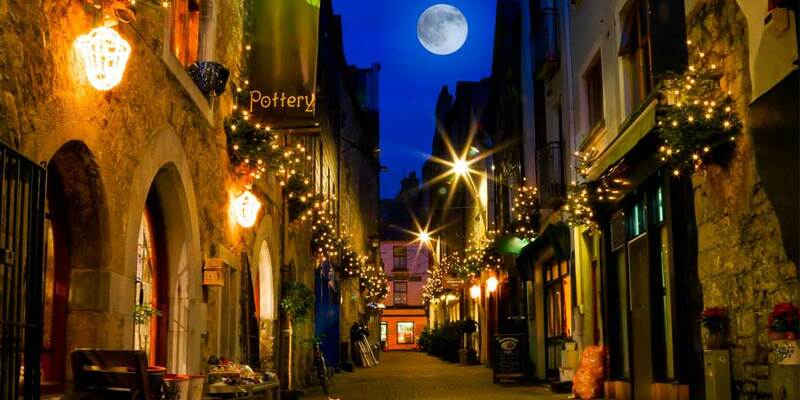 Tonight after dinner you can rest at the hotel or visit one of the local pubs famous for traditional Irish music. Day 2: After breakfast we take our bus through the Burren to the Cliffs of Moher. 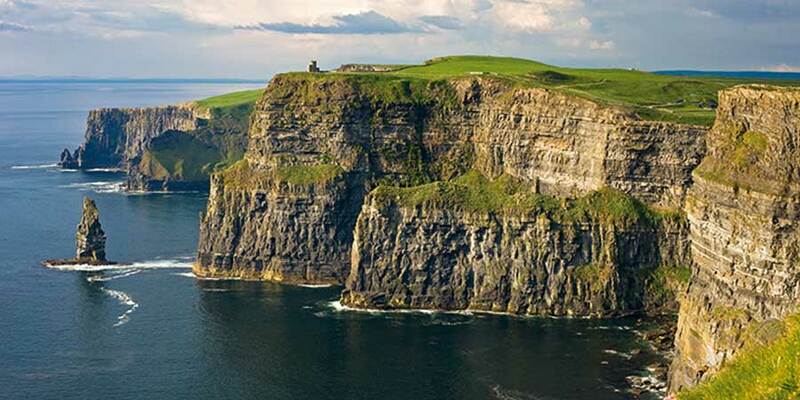 These dramatic cliffs, overlooking the Atlantic, are famous the world over and a very popular visitor destination. Our approach however is different and rather than take a bus to the cliffs and jump out and on again we trek along a designated path which makes its way along the cliff edge from Hags head to Doolin. The latter is famous for traditional music and we will tarry awhile to appreciate before returning to Kinvara. Day 3: Our morning ferry ride allows us to appreciate the wonder of the Cliffs of Moher from the ocean as we make the short journey to the smallest of the Aran islands –Inisheer. 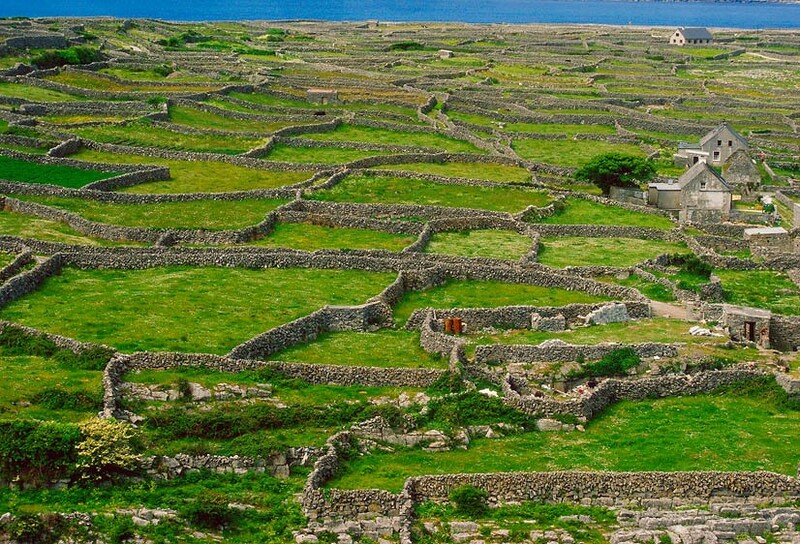 We spend the day exploring the Island by foot before departing on the evening ferry to the largest of the Aran Islands- Inishmor where we will have our evening meal and accommodation for the night. The Aran Islands are Gaelic speaking so a visit to the pub tonight provides the opportunity to hear this language spoken by locals. Day 4: Today we embark on a trek through Inish Mor providing the opportunity to appreciate the history of this Island from the Bronze Age to the present. The highlight for many is the dramatically positioned fort of Dun Aeongus at the edge of the sea but as you will see, there is so much more to this magical location. Overnight in Aran Islands. Day 5: A morning ferry ride from the Aran Islands to Galway City culminates in a guided walk through the medieval city bringing us right back to where we began. The tour traces the history of the city through the folklore, architecture waterways and archaeology.